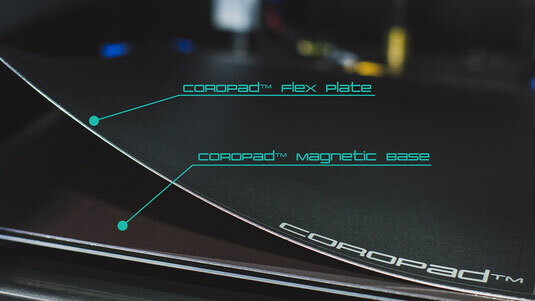 COROPad ™ Magnetic Flex System - is a solution that uses the well-known COROPad™ adhesive pad combined with a flexible plate and magnetic base. Designed to ensure the perfect adhesion of the printed models to the substrate and its simple separation after the completion of the 3D printing process. COROPad™ Flex Plate - is a five-layer flexible plate with ferromagnetic properties. 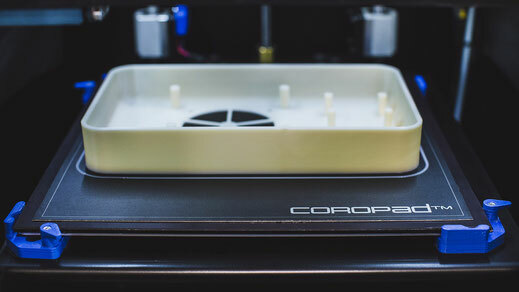 The 3D printing process takes place directly on it and afterwards the COROPad™ Flex Plate can be removed and bent to simply separate the printed model from the COROPad™ substrate. The high-quality spring steel used as the core of COROPad™ Flex Plate allows multiple bending of the whole plate without fear of distortion. 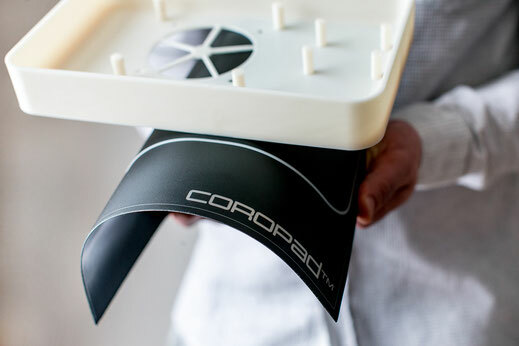 In addition, the COROPad™ is a replaceable element of the entire plate and can be replaced by the user in case it is worn. • Easy implementation onto the bed, thanks to proper stiffness (30s.). • Possible continuous operation at high temperatures. • Sizes adapted to the most popular 3D printers. • Standard sizes: 165x165, 155x235, 202x202, 165x255, 225x255, 255x255, 300x300. Compositum ABS ST™ with using the COROPad™ Magnetic Flex System. Download the COROPad™ Magnetic Flex System installation instructions. There are also recommended temperatures for various material groups and useful tips for long and safe operation.